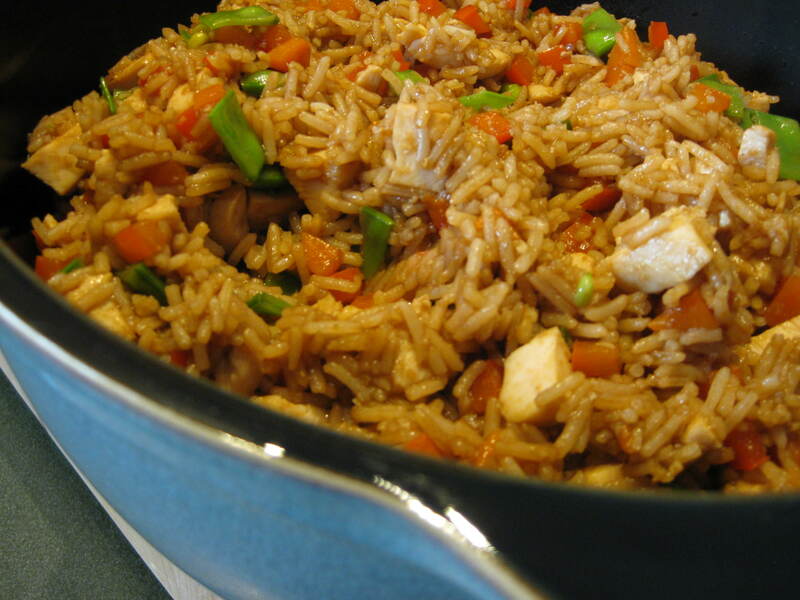 We love this fried rice recipe. It’s super easy to make. You can also prepare this a day in advance and just reheat in a skillet over low heat to warm through. I pounded my chicken flat and browned it in a skillet. I also cooked the rice according to package directions. I always use basmati rice for this recipe. I took this recipe from my favorite cookbook, “The Complete Light Kitchen” by Rose Reisman. 1. Bring 1 1/4 cups of water to a boil in a saucepan. Stir in the rice. Cover, reduce the heat to low and cook for 12 minutes. Remove from the heat. Let stand, covered, for 10 minutes. Transfer to a bowl. Cool. 2. While the rice is cooking, preheat the barbecue or a non- stick grill pan to medium-high and spray with cooking oil. Cook the chicken for 6 minutes per side, or until cooked through and no longer pink in the center. Dice and set aside. 3. Whisk the stock, soy sauce and hoisin sauce in a small bowl. Set aside. 4. Cook the carrots in a pot of boiling water until tender-crisp, about 4 minutes. Drain. 5. Spray a non-stick wok or large skillet with cooking oil, add vegetable oil and place over high heat. Add the red peppers, snow peas, garlic, ginger and carrots; cook for 2 minutes, stirring constantly. Add the cooled rice and cook, stirring for 2 minutes longer. Stir in the stock mixture and the chicken. Cook for 1 minute longer, until heated through. 6. Serve immediately, garnished with green onions. Chef Michael Smith states that this dish is an all-time favourite of his family, in his cookbook “The Best of Chef at Home”, and I can clearly see why. I really loved this recipe. 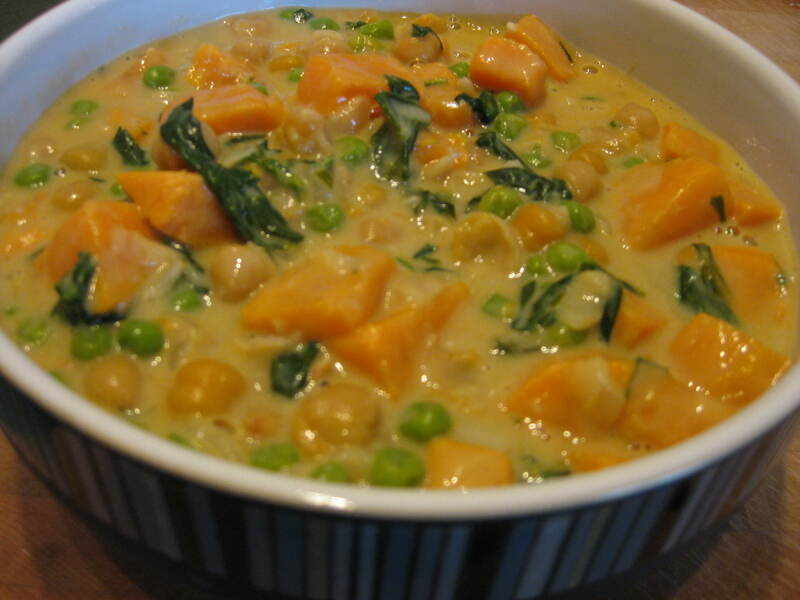 I especially loved all the greens added in, with the sweet potatoes and the chickpeas. The flavours of the coconut milk and the peanut butter are amazing. I served my curry with rice since it is very rich. I used low-fat coconut milk and low-fat peanut butter with great results. I also just used one sweet potato, but it was rather large. I also used green Thai curry paste. I did not find this recipe to be overly spicy, so I would add more next time. Yellow Thai curry paste is the mildest, red is a bit spicier and green is the spiciest. 1. Add a splash or two of vegetable oil to a stockpot over medium-high heat. Toss in the onion and garlic and sauté them until they’re lightly browned, about 5 minutes or so. 2. Grate the frozen ginger into the pan with a microplane grater or standard box grater and add the Thai curry paste. Continue cooking until the spices are heated through and fragrant, another few minutes. 3. Add the sweet potatoes, chickpeas, coconut milk, orange juice, peanut butter and salt. Bring to a simmer, lower the heat and continue simmering until the sweet potatoes are tender,about 30 minutes. Stir in the peas, spinach and cilantro. Serve over rice. This recipe comes from The Best of Bridge. It is a family favorite. I alternate between making garlic mashed potatoes and regular mashed, but the garlic is the most loved. I like this recipe since I can make it ahead of time. I can make the meat bottom and leave it in the fridge. I then make the potato top when I’m ready to bake it. 1. Using a large nonstick frying pan, cook ground beef over medium heat until no longer pink. Break meat up as it cooks. Add onions and garlic; cook until softened. Stir in flour, salt, pepper, thyme and savory. Add broth, water Worcestershire, bay leaf and carrots. Simmer, stirring occasionally, for about 20 minutes, or until quite thick and carrots are tender. Stir in corn. Remove bay leaf. 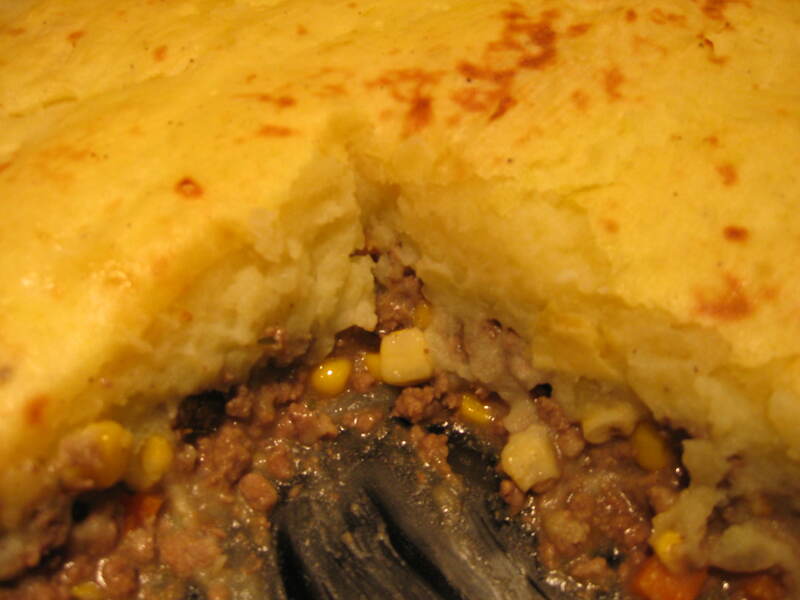 Spread mixture in a deep casserole. Let cool slightly. 1. Place potatoes in a saucepan with garlic and cover with water. Add salt, bring to boil and simmer gently until tender. Drain well and mash. Beat in buttermilk, salt and pepper. Reserve 1 Tbsp (15 ml) of beaten egg and add remainder to mixture. Spread potato mixture over meat and brush with reserved egg. Bake at 350F for 40-45 minutes. My husband and my son love anything spicy. I came across this great bacon recipe in my Epicurious cookbook ” More than 250 of our Best-loved Four-fork Recipes”. The cookbook notes that if thick-cut bacon is not available, regular packaged bacon can be used but will need to be cooked in batches with slightly shorter cooking times. This bacon is great for breakfast or even on a club sandwich at lunch. 1. Put the oven rack in the middle position and preheat the oven to 350F. 2. Stir together the brown sugar, cayenne, and black pepper in a small bowl. 3. 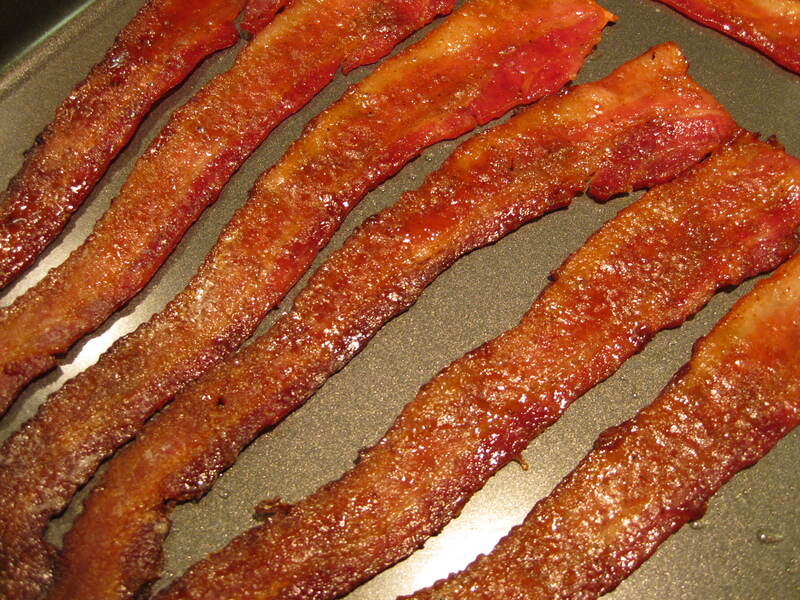 Arrange the bacon slices in a single layer (not overlapping) on the rack of a large broiler pan or baking sheet. Bake 20 minutes. Turn the slices over and sprinkle evenly with the spiced sugar. Continue baking until the bacon is crisp and deep golden, 20 to 35 minutes more (check bacon every 5 minutes). Transfer to paper towels to drain. I loved this dish! I found it in “The Heart of the Plate” by Mollie Katzen. I made my stew with brown basmati rice. Make sure you give yourself lots of time to cook the rice as it takes 45 minutes. The author notes that low-fat yogurt works fine in this dish, but for a richer taste, consider using a whole-milk yogurt. A thicker, Greek-style yogurt, including non-fat, will also work well. 1. Place a soup pot, large saucepan, or Dutch oven over medium heat for about a minute. Add the oil and swirl to coat the pan. Add the onion, ginger, mustard seeds, cumin seeds, and 1/2 teaspoon of the salt. Cook, stirring, for about 5 minutes, or until the onion becomes translucent and the spices begin to snap. Add the ground spices and garlic and cook over low heat, stirring often, for another 5 minutes. 2. 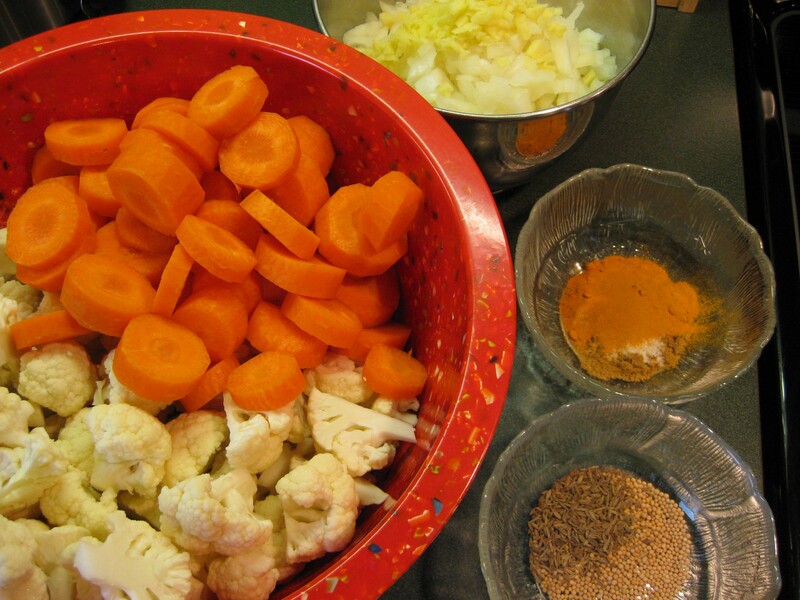 Add the cauliflower and carrots, along with another 1/4 teaspoon salt, stirring until the vegetables become coated with the good stuff in the pan. (If the mixture appears dry, splash in the water, a tablespoon at a time.) Cover and cook over medium-low heat, stirring occasionally, until the vegetables are just tender, 15 to 20 minutes, depending on the size of the pieces and your taste in vegetable texture. 3. 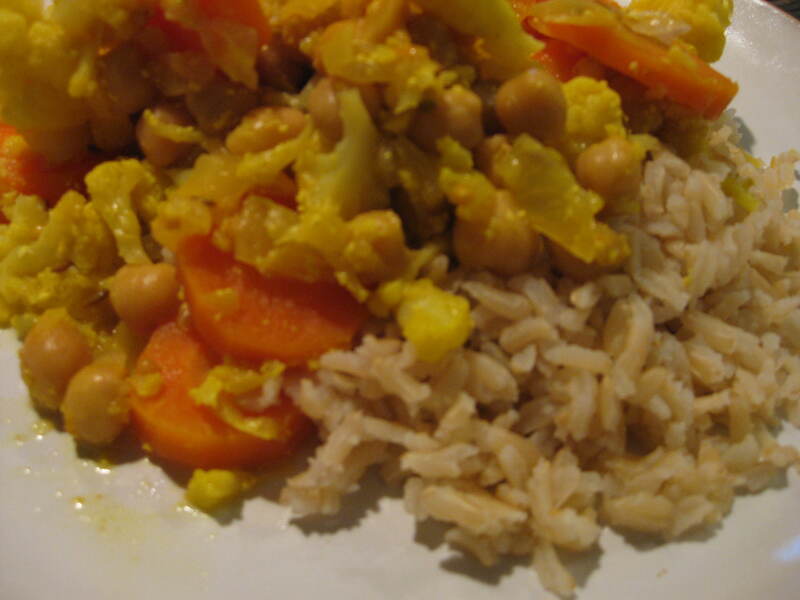 When the vegetables are done to your liking, gently stir in the yogurt and chickpeas, mixing until thoroughly combined. Taste to adjust the salt and add cayenne to taste. 4. Stir in the cashews just before serving. Serve hot or warm over rice. I love dinners that you and your guests have to build yourself. It is fun adding your own flavors to your meal. I made fresh guacamole, and fresh salsa as a condiment. I marinated both chicken and flank steak for this recipe so my guests had a choice. I also sauteed onion slices and red pepper strips. This recipe was taken from The Best of Bridge – The Best of the Best and more. 1. 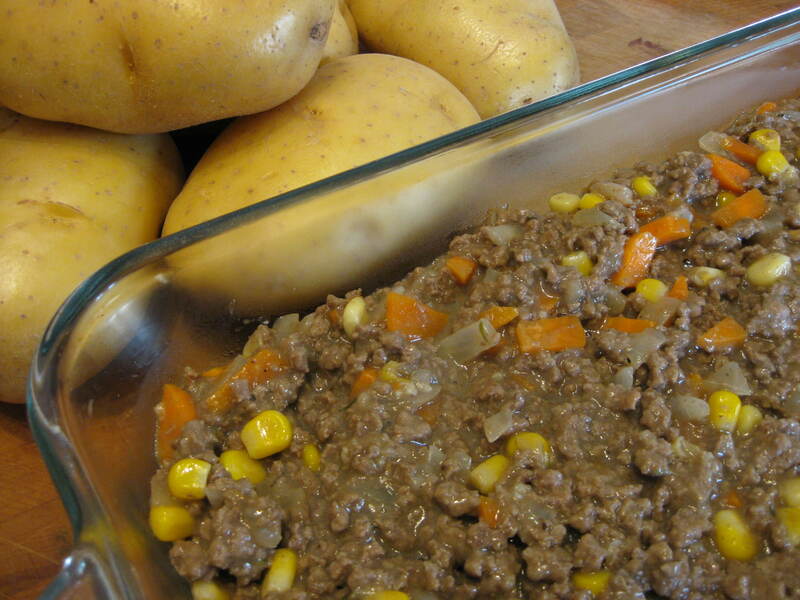 Combine marinade ingredients in shallow casserole. Score both sides of steak. Add meat. Cover and refrigerate several hours. Remove from marinade and BBQ. Slice in thin strips across the grain. 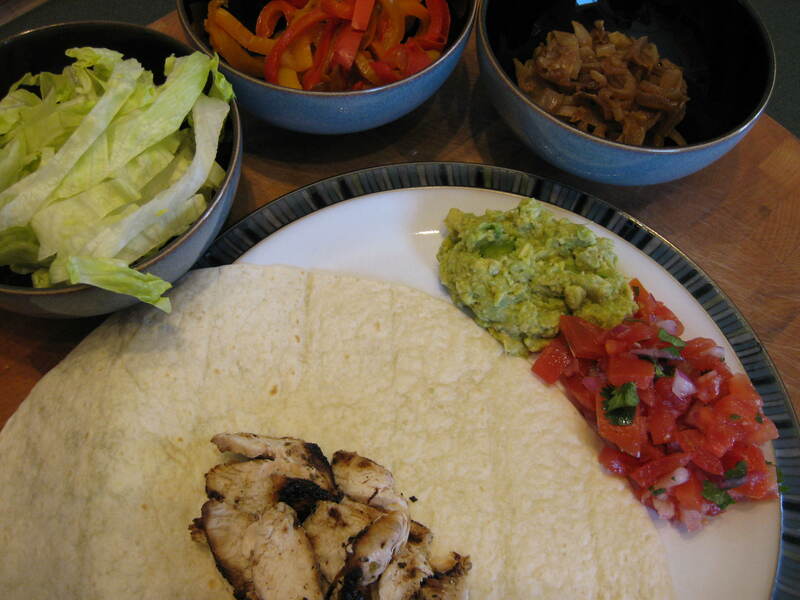 Wrap in warm tortillas with onions and peppers and any or all of the other toppings.